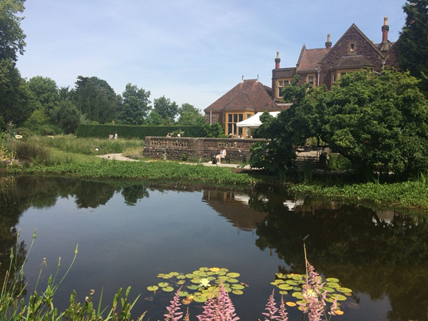 The Holmes at Bristol Botanic Garden is reflected in this picturesque pool. What a delightful jewel of a place this Botanic Garden is! And what a fascinating tour our group was taken on by our hugely informative guide, Charmaine Hawkins, who ignited our interest and imaginations as we walked around this amazing collection of plants and flowers from many of the world’s habitats. She added a fascinating depth of detail which enriched our visit on this dazzlingly sunny day and helped to make it an unforgettable experience. 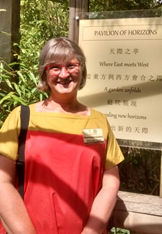 Amongst the many groupings of plants from different areas and eras of plant evolution, – the Botanic Garden cultivates around 4,500 different plants from around the world- those we visited included the Western and also the Chinese Medicinal Herb Gardens. 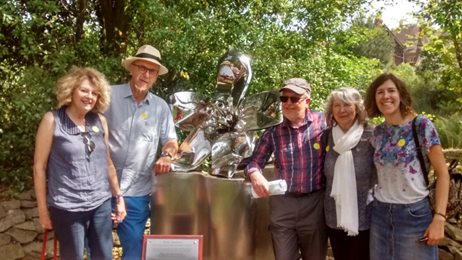 The APS group photograph was taken by the stunning sculpture of a Kapok flower which was presented by the city of Guangzhou in southern China as an important symbol of the ‘sisterly relationship’ between Bristol and Guangzhou: it brings together governments, universities, industry, trade, research and education. The medicinal herbs grown in the Chinese herb garden area were clearly labelled, as were the western medicinal herbs. In fact, labelling throughout the gardens was excellent. 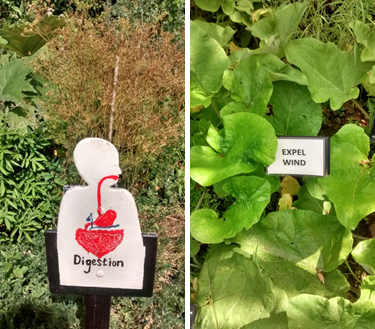 Some examples of the excellent labelling found in the herb garden. 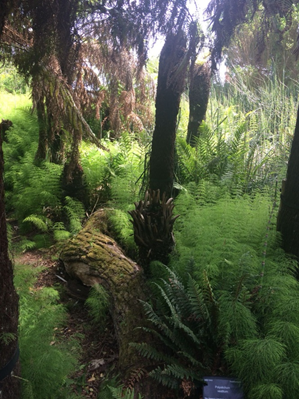 Amongst the many fascinating areas in the Botanic Garden was the Evolutionary Dell where the plants of the Jurassic world are part of the experience! The University of Bristol Botanic Garden’s Evoluntionary Dell includes plants from the Jurassic Period. As we walked around the various facets of the grounds, our tour guide Charmaine (pictured above) explained that the planting in the gardens represented the new system of plant classification which has resulted from a fresh understanding of plant relationships. This has had huge significance for the world of Botany. There were many other highlights on the tour, including a partly constructed African round house, still awaiting the thatched roof and the mud and straw walls to be added. The tour concluded with a visit to the large glass houses.